1 Bdrm Top flr Flat. Hall. Lounge. Dining kitch. Bdrm. Bathrm (CT Band - A). Garden. Price around £110,000 Entry by arr. Viewing contact solicitors. Below Home Report Valuation (EPC band - D). Situated on a quiet one way street, yet only a few minutes walk from the city centre and its excellent range of amenities including public transport links and recreational facilities, we are delighted to offer for sale this one bedroomed top floor flat which has been completely refreshed to create a stylish and spacious city centre apartment. Forming part of a granite tenement the flat perfectly merges traditional elements with the conveniences of modern city living. The accommodation comprises a welcoming entrance hall which leads onto the generous lounge with feature fireplace and continues through to the impressive dining kitchen, well appointed with integrated appliances. 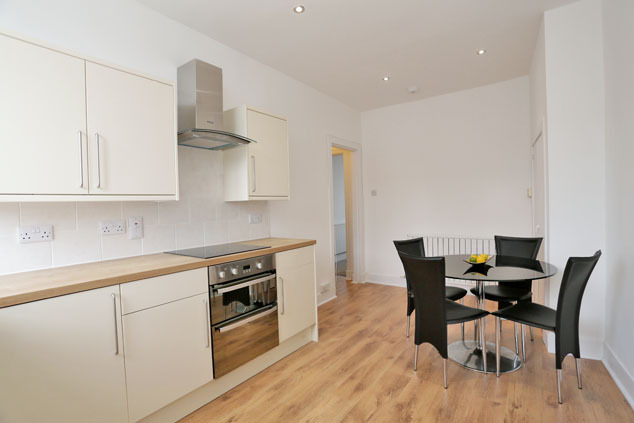 A double bedroom overlooks the front and finally, there is a centrally set bathroom with an upgraded white suite. 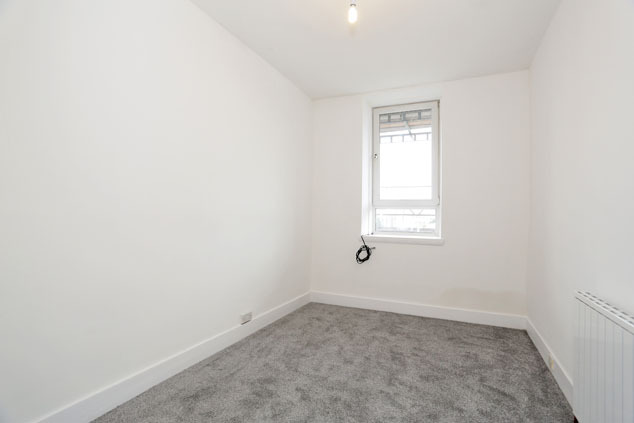 Outside, the property enjoys the shared use of a rear garden and handy storage is provided by a secure cellar located within the mutual basement and within the communal loft space. This is truly an impressive property which is in ready to move into condition and will undoubtedly be of appeal to the discerning buyer, therefore early viewing should be sought to appreciate the excellent location, stylish finish and proportions on offer. 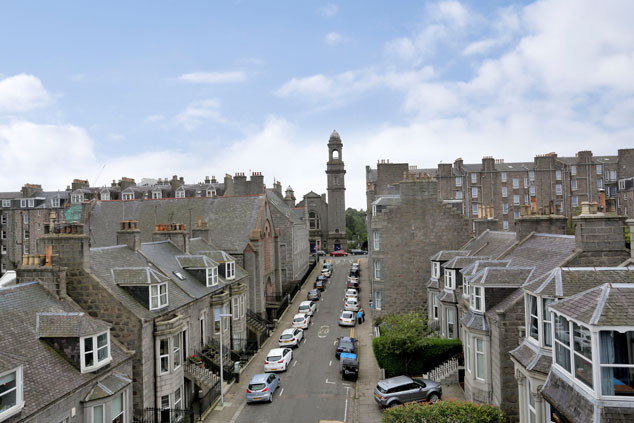 Rosemount is a popular residential area to the north of Aberdeen city centre. A wealth of specialist shops including a cheesemonger, family butcher, fish monger, chemist and supermarket are all within walking distance, along with lovely cafes and local craft shops. 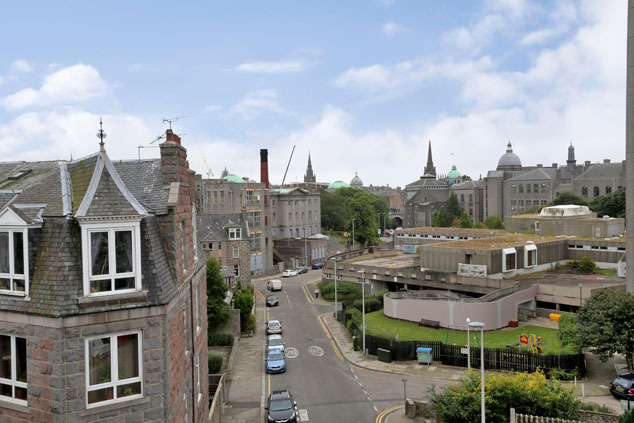 The city centre is some ten minutes’ walk form the property as is the hospital complex at Foresterhill. Anderson Drive is easily accessible as are the main business centres to the north and south of the city. Regular public transport is readily available to many parts of the city and lovely walks can be enjoyed in Westburn and Victoria Parks which are close by. Communal Hall The communal hall is entered via a security entry door, is neat and tidy with windows overlooking the rear and additional lighting. 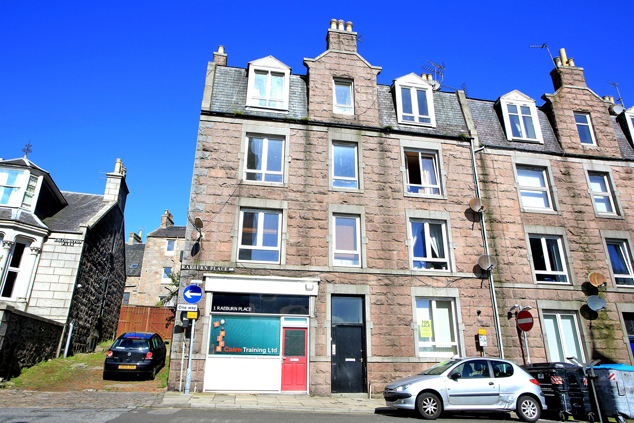 A staircase rises to the upper floors and there is access to the basement where the property has a secure cellar. 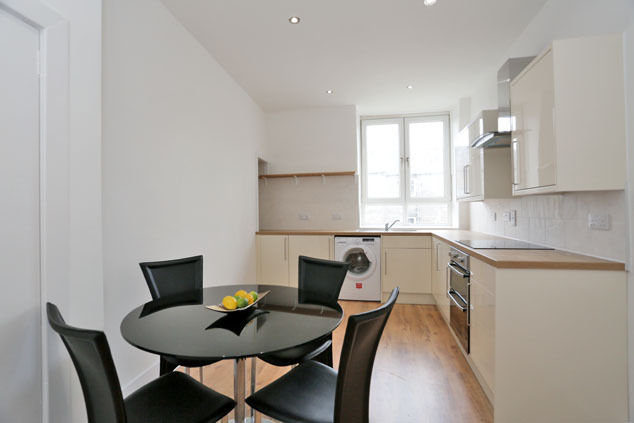 On the half landing below the flat there is a shared cupboard and there is access to the communal loft space. 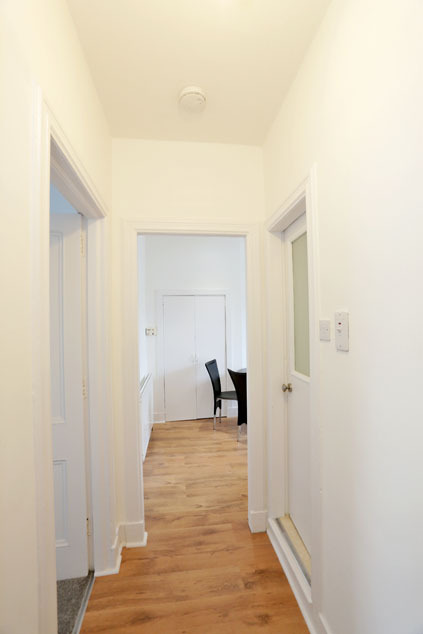 Entrance Hall A natural wood door leads into the hallway which has practical laminate flooring and fresh tones. A high level cupboard conceals the fuse box and electric meter. Security entry handset. Smoke alarm. Lounge 12’2” x 11’9” [3.72m x 3.59m] approx. With a large window overlooking the front, this generously proportioned lounge is wonderfully bright and airy with enhancing neutral décor, decorative cornicing and warm carpeting in modern grey tones. 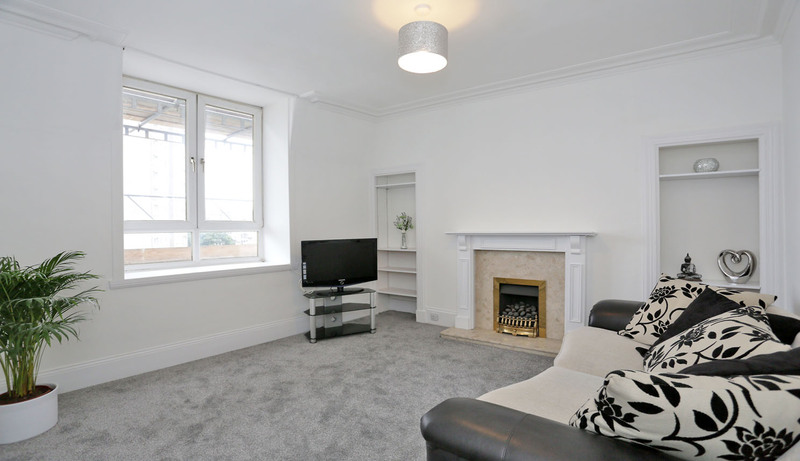 The room is focussed around a gas fire with decorative surround and marble hearth and is framed on either side by shelved alcoves. 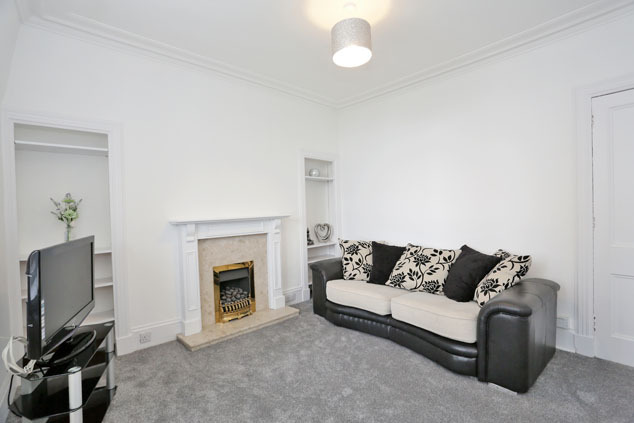 The good proportions allow ample space for soft furnishings. TV point. Telephone point. Dining Kitchen 16’2” x 9’5” [4.93m x 2.89m] approx. With a view over the rear, this impressive, newly installed kitchen has ample space for a dining table and chairs. It is fitted with an excellent range of base and wall units in cream gloss edged with splashback tiling and topped with wood effect work surface incorporating a stainless steel sink with mixer tap and drainer. The integrated appliances include a Hotpoint electric hob with chimney extractor above, double oven with grill function, fridge and freezer. The free standing washing machine will also be included and a double cupboard provides storage and houses the gas meter. Bedroom 12’0” x 8’0” [3.66m x 2.45m] approx. 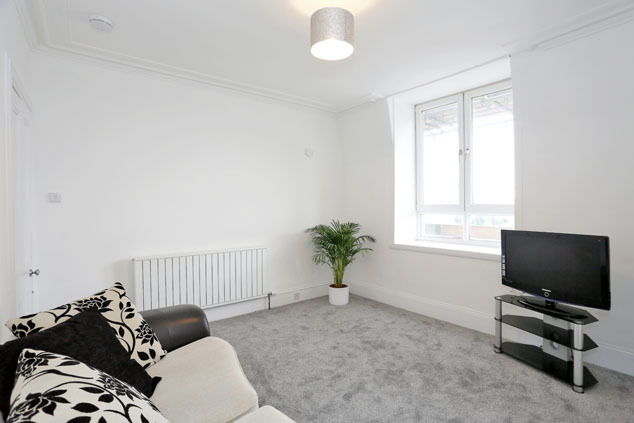 To the front is this spacious double bedroom which has been refreshed with simple neutral tones and carpeting. A large window affords the space with lots of natural light and there is ample floor space for required free standing furniture. TV point. Bathroom 8’2” x 4’11” [2.51m x 1.50m] approx. 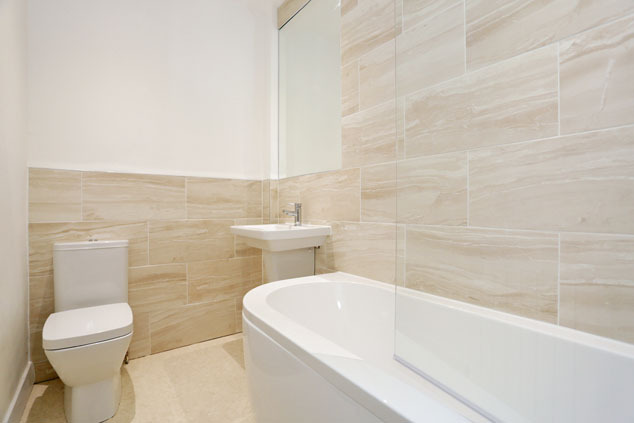 An opaque glass door allows light into this centrally set bathroom which has been recently upgraded with a thoroughly modern suite. It is fitted with a w.c., half pedestal wash hand basin and bath with electric Mira shower above and glass screen. Finishing touches include extensive splashback tiling in stone effect, wall mounted mirror and vinyl flooring. Outside The fully enclosed rear garden is well screened by a high level wall making it very sheltered and is mostly laid to lawn. Notes Gas central heating. Double glazing. EPC=D. 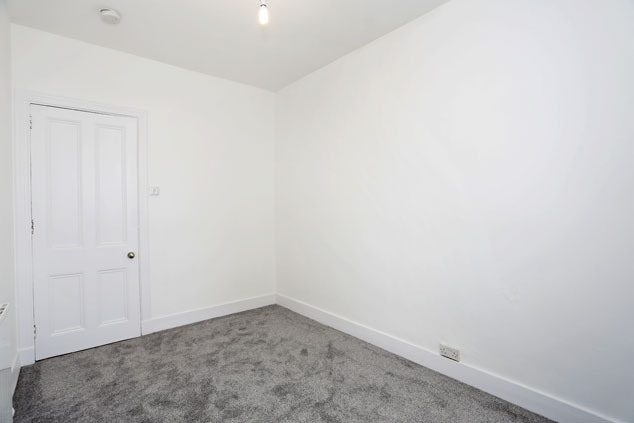 The subjects will be sold inclusive of all fitted floor coverings, light fittings, curtains and blinds along with all integrated appliances and free standing white goods.